Pictured left to right are Elaina Hahn with Mr. E, Liam LeGrand with Miss L, Sadler Mattingly with Mr. X, and Dylan Levan with Mr. 0. The kindergarten class of Guardian Angel School in Oran, MO made it through their alphabet with the letter people. That means it is time to celebrate letter people week, which occurred from April 8 through April 12. 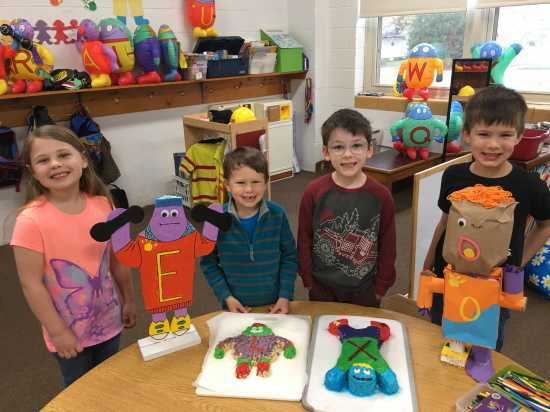 On Monday, the students brought their letter person project to school. Elaina Hahn's project was Mr. E (Exercise Energy) made out of wood. Liam LeGrand brought Miss L (Longest Laugh) made out of rice krispy treats. Everyone enjoyed eating Miss L in the morning. The afternoon treat was provided by Sadler Mattingly. He brought Mr. X (X is for different), made into a delicious cake. Last but not least was Mr. O (Opposites), made out of paper, and created by Dylan Levan. On Tuesday, the kindergarten parents, as well as some teachers, brought desserts for a cake walk. Each class and the teachers got a turn doing the cake walk, with a chance at taking a delicious dessert home. The students also enjoyed resting with the 8th graders. The children ate lunch in their classroom with their teacher on Thursday and then received a tour of Father Randy's house. On Friday the class got to watch a movie while they ate popcorn and had a drink. The kindergarten students very much enjoyed all of the excitement.